A super personalised gift for couples. 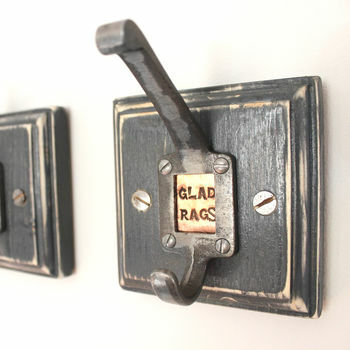 This set of two Victorian reproduction iron coat hooks with an inset hand stamped copper plaque and mounted on dark grey pine is an ideal 6th (iron) or 7th (copper) anniversary gift as there is always a place for another coat hook or two! 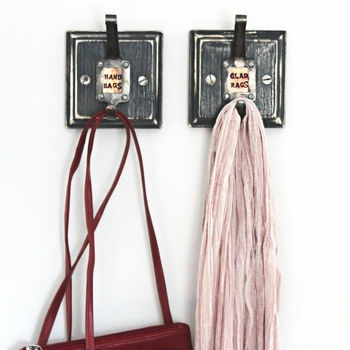 These coat hooks are each lovingly handcrafted where the copper label is hand stamped using traditional methods, making every item a little bit different. Each coat hook can be personalised with up to 4 letters across on 2 lines - this can be done by adding your text in the personalisation tab. Perhaps initials, numbers or a significant year? UK delivery will cost £2.90. Please allow up to 7 days for your Two Personalised Iron And Copper Coat Hooks to arrive. We will notify you once your order has been dispatched.